It is the holiday season and the air is abuzz with shoppers, travelers, and partiers. No wonder our carb and sugar consumption peaks in November and December. How else would we keep our blood flowing and feet moving. These merry months are an especially busy time for Emily Robins, who can be seen dashing around DC, capitalizing on our sugar dependencies. Actually, the truth is, since the inception of her gluten-free baking business, the Goldilocks Goodies founder has not stopped moving. 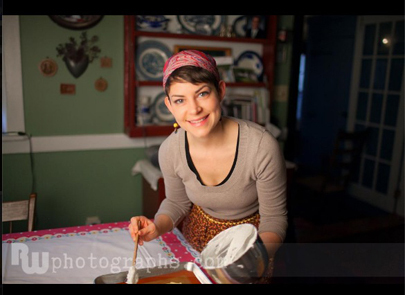 She splits her time between Lancaster, PA, where she sources her fresh, locally farmed ingredients and bakes in her family’s kitchen, and Washington DC, to make deliveries to boutique coffee shops and set up camp at weekly farmers markets. Two years ago, Robins’ fruitless quest for a nourishing, satisfying, gluten-free cookie ended at her stand mixer. Out of desperation she created Goldilocks Goodies’ signature, grain-free, nut-butter cookies, made with a short list of ingredients you can actually pronounce. They are chewy, sweet, fresh, and taste like real food, rather than artificial flavors and preservatives. From cookies Robins’ repertoire quickly grew to brownies, muffins, whoopie pies, crusted pies, coffee cakes, quiches, loaves and more. She has mastered the ever-challenging gluten-free sandwich bread with a recipe that holds together when eaten fresh and toasts beautifully out of the freezer. The cinnamon-raisin bread with a hint of cardamom is more versatile than it sounds. Stuff two slices with turkey for a sweet and savory lunch or spread them with peanut butter to get the day started. Not surprisingly, Goldilocks’ hand-made goodies do fetch a higher than average cost. With local, preservative-free ingredients, quality and freshness demand the higher price. The one-woman machine is baking for hundreds and delivering while the goods are practically still hot. Who wouldn’t pay an extra few bucks for that! Back in November, Sister Seitan and I snagged seats in Emily Robins’ holiday cookie making class at the Living Social headquarters. 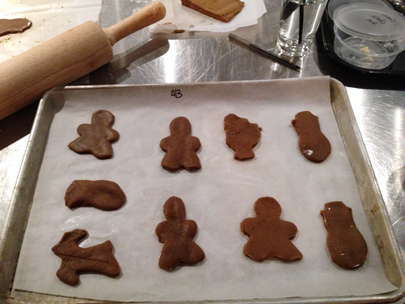 We baked dozens of delectable gingerbread and sugar cookies that my family inhaled after Thanksgiving dinner. Glutie Foodie (GF): What was your transition to a gluten-free lifestyle like? 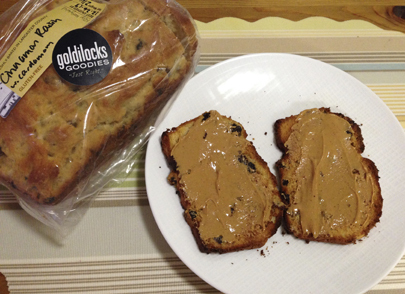 Goldilocks Goodies (GG): I had just moved back to the States after living in China for 4 years. I was accustomed to not eating sandwiches, cereals and desserts, so I imagine it wasn’t as hard of a transition as it is for most people. There’s not a day that goes by that I don’t miss a great, chewy, thick pizza crust, though! GF: Tell us about the moment you decided to share your “Just Right” cookies with the world by starting a g-free baking business. GG: I was having dinner with a friend and business mentor of mine when I came up with the name Goldilocks Goodies. After a year of thinking about what I wanted to do with my life, and another year of coming up with a business plan and deciding how to transition, I knew I was ready when I had the name picked out. It perfectly fits my story of trying a lot of ready-made gluten-free foods and finding them too dry, too sugary, too grainy, or too processed with preservatives and flavors. My products are not any of those—they’re just right! And the alliteration of Goldilocks Goodies is an added bonus for the bookworm/nerd in me. I decided to keep “gluten-free” out of the name. My goal is to provide treats everyone can enjoy that just happen to be gluten-free for those of us that check labels! GF: You bake in the kitchen in which you were raised, on land owned by your family for generations. How have your mother and grandmother influenced your current career path? GG: My mother and grandmother have both been a huge influence for me. Every meal was homemade from local ingredients, and my mom was baking all the time—just little things—but we always had homemade cookies, pies and treats. It was a great gift to eat locally and seasonally and I aim to do that with my line of baked goods as well. Of course, everything my grandmother makes is wonderful, and she doesn’t use any recipes. She learned by watching her mother-in-law in the kitchen so that she could help prepare for large gatherings: holidays, corn roasts or pig roasts, barn raisings, Sunday dinners, and harvest days when neighboring farms would pool their labor. Most farmers would eat very simply through the week, but there would always be plenty of variety when folks got together. These women are extremely hard-working and have very talented hands in the kitchen, both of which I aspire towards. GF: What is the best thing to come out of your grandmother’s kitchen? Have you adapted the recipe to be gluten-free? GG: I’d have to say her Chocolate Caramel Cake is the most requested and most famous of all. The caramel icing—made in an iron skillet—requires a lot of love and patience and was my great-grandmother’s recipe (who probably got it from her mother). Every grandchild wants it made for their birthday and it would be the most coveted dish at a picnic or potluck. I HAD to convert this to gluten-free and I make it by special order for other special occasions. GF: That’s true! You and Mr. Green Bean conspired earlier this year to surprise me with gluten-free birthday cake. You baked your famous Chocolate Caramel Cake and Carrot Cake (a personal favorite) for the occasion. Both were utterly delicious. My guests would never have guessed the cakes were gluten-free were it not for Glutie Foodie stuffing her face with seconds…and thirds. Nowadays there are many options for gluten-free birthday cake. How do your products stand apart in the growing gluten-free food market? GG: The common opinion is that gluten-free foods are sub-par in taste, texture and quality. I refuse to buy those products currently on the market and strive to make ones that are gluten-free AND delicious. I’m proud to say that some customers of mine don’t need a gluten-free diet; they just appreciate something fresh, natural and locally sourced. My treats aren’t made with cheap fillers, lots of added sugar or artificial ingredients like a lot of other products are that are allergen-free. GF: What has been most challenging about starting Goldilocks Goodies? GG: The most challenging part, by far, is the amount of energy it takes to start a baking business. I have had chronic Lyme disease for over 10 years now, and while most of my symptoms are much better managed now than at the beginning of my illness, I still fight aches, pains, and fatigue that make 12 to 14-hour days of baking, driving, delivering, marketing and paperwork a struggle. GF: What has been most rewarding about starting Goldilocks Goodies? GG: The feedback that I get is truly what makes this all worth it. I’ve received the sweetest comments and emails from people saying they are fans for life, or that their daughter had a very memorable birthday cake that year because of me, or from a food writer letting me know I “single-handedly elevated [his] opinion of the potential of gf baking for non-gf diners.” Yeah, that was a good day! GF: What do you envision for Goldilocks Goodies 5 years from now? GG: My goal is to have nation-wide distribution within 2 years. There’s no comparable cookie on the market that’s free of the top 7 allergens and is as satisfying and delicious as mine. I want to reach fans around the country and then, who knows? Maybe I’ll end up selling my cookies in China! I also have goals of making a cookbook based on seasonal produce for each region of the US. Fixing the broken food chain in the States is integral to my hometown, the preservation of farmland and the way of life of my neighbors, and, I believe, the health and environment for each and every one of us. 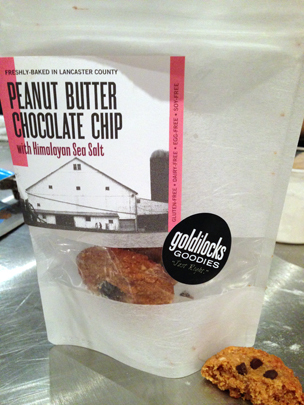 Goldilocks Goodies’ savory and sweet treats are available at select locations throughout the DMV, online, or by special order. Categories: 5 Spoons, American, Baked Goods, Comfort, Dessert, Gluten-Free, Local, Maryland, Organic, PA, Vegan, Virginia, Washington DC | Permalink. Pretty-Good Is the New Great! Enter your email address to follow Glutie Foodie and receive notifications of new posts by email.